The question of “how to store your bitcoins” is one of the most important decisions for a Bitcoin user to make, and that is why we have done an extremely thorough Bitcoin wallet review for all major Bitcoin wallets. In this article we will perform bitcoin wallet reviews, including providing the current best option, by looking at ease of use, security and advanced features for the major wallets in each category: Online Bitcoin Wallets, Desktop Bitcoin Wallets and Mobile Bitcoin Wallets. To save you some time our conclusion to maximize ease of use, security and advanced features is to use the most well rounded Blockchain.info mobile bitcoin wallet (Android or Apple Store) coupled with the ultra-secure and advanced desktop bitcoin client Armory. Regardless of what kind of electronic payment system you are using if you want to spend digital money then you need to have a digital wallet. Bitcoin differs from every other online payment system. Bitcoin has no central provider and anyone can build a bitcoin wallet. Consequently, there are several dozen bitcoin wallets to choose from and they all vary in terms of ease of use, security and advanced features which makes it important to carefully consider these bitcoin wallet reviews. The Bitcoin wallets come in many different varieties often with trade-offs between ease of use, security and advanced features. Some are websites that simply offer the basic functions of sending and receiving bitcoins and attempt to make these functions as easy to use as possible. Others are fully-featured online bitcoin wallets that offer the user more power and control including advanced options such as custom transactions. Then there are bitcoin wallets that are desktop applications which tend to be more difficult to setup but offer higher security and more advanced features across the board. And digital wallets would be incomplete without a mobile strategy and there are plenty of mobile Bitcoin wallets targeted at this huge market. The list of options to choose from is daunting but we have done the hard work of narrowing the list from dozens to a few in this Bitcoin wallet review. First, ask yourself the question: Do I want a client I can download to my own computer, an online wallet interface, or a client for my smartphone? If you are an avid Bitcoin user then you may wish to have two of the above or even all three. It is extremely popular to have an easy-to-use, medium-security, online and smartphone bitcoin wallet for spending and a highly secure desktop Bitcoin wallet for savings and advanced features. Once you have narrowed down your use case then look at the options available within each category. Do you want a client that offers more powerful features or do you want something that is easy to use? Perhaps you paranoid and want extra security? In all three of the categories there are different bitcoin clients to suit various needs. Blockchain is a hybrid between an online wallet and a desktop client and seeks to offer close to desktop-level security with the convenience of an online application. Unlike the alternatives, Blockchain works by storing your wallet encrypted, and running the code necessary to decrypt your wallet and sign transactions in your browser, so the operators of Blockchain have no way to access your funds. However, there are some security complications with relying solely on Javscript cryptography, so users who want to take full advantage of the increased security that Blockchain has to offer should install either the Chrome or Firefox extension or the wallet verifier addon for Safari. The client also offers a number of advanced options: the ability to download and backup your wallet to your computer or a printed sheet of paper, private key import and export, brain wallet support and an offline transaction mode are all available. Coinbase is a step up from Instawallet in terms of both complexity and security. But it is still basic with only standard sending and receiving functionality. Nevertheless, Coinbase has two features which make it a very convenient wallet for the beginning user. First, the wallet allows you to avoid dealing with Bitcoin addresses entirely and instead send directly to an email address. This makes the transfer internally if both parties have a Coinbase account and if the receiver does not then it sends an email message to the recipient instructing them to immediately create an account to receive the bitcoin payment. Second, Coinbase includes its own built-in bitcoin exchange which empowers users to convert between bitcoins and US dollars directly through their bank accounts using ACH and they have processed tens of millions of dollars worth of orders. Unfortunately, the bank account integration is only available with banks inside the United States and only a limited amount can be bought or sold at a time depending on verification and other Coinbase policies. 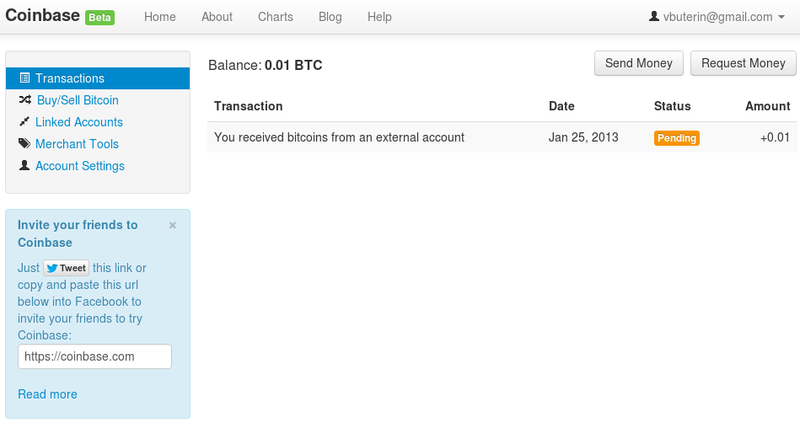 Third, there is a Coinbase Android app. Many wallets are cross-platform compatible. Coinbase does not claim to be trust-free and all bitcoins are stored in a centralized location controlled by its operators. This means you do not have absolute control over your bitcoins and there have been technical incidents which have left users without wallet functionality, unconfirmed transactionsand may have comprised data or personal information. But so far no customer funds have been lost and these appear merely as growing pains for this new startup. Nevertheless, Coinbase raised $5m of venture capital funding and will likely be around the Bitcoin ecosystem for the foreseeable future and the founder and venture capital investors are unlikely to betray their users by absconding with bitcoins. Their current corporate policy of storing 85% of users’ funds in offline cold storage means that the bitcoins are likely well-protected against third-party theft. Like Coinbase, WalletBit attempts to create an online wallet that is easy to use but has all of the convenience features that beginning users need. WalletBit allows sending to email addresses as well as a built-in conversion to and from the user’s local currency through the Bitcoin exchanges Bitcoin Nordic and MtGox. These options are less convenient than Coinbase’s bank account integration with ACH but they have much higher deposit and withdraw limits and are more widely available around the world. WalletBit is also a merchant services provider. If you are interested in accepting bitcoins for your business, whether online or brick-and-mortar, then WalletBit has a wide variety of integrated supplementary tools to assist you. WalletBit’s security model is similar to that of Coinbase but their operators are neither more established and prominent than Coinbase’s nor have they raised the same amount of venture capital. So you should consider the staying power of the developers in the bitcoin wallet reviews. Armory is the most advanced and secure Bitcoin client available and has been developed by Alan Reiner who is one of the world’s premier experts in Bitcoin security. If your use case requires safely storing large value in bitcoins then Armory is the only practical choice. Armory offers a range of features even larger than either Blockchain.info or the Satoshi Bitcoin client. However, all of these tremendous benefits come at a price: convenience. There are three modes a user can choose: Standard, Advanced and Expert. But even the Standard mode requires some serious study to become competent. Of course, there is standard bitcoin wallet functionality like storing encrypted wallets, managing an address book, changing or removing a passphrase, backing up either individual private keys or via paper or digital methods, deleting or removing wallets and creating watching-only addresses. However, beyond the standard functionality expected from any Bitcoin wallet client, Armory pays attention to small details like having a graphical keyboard to protect against keyloggers and other features empower users to manage multiple wallets, import or sweep private keys, sign messages (although this functionality is not compatible with the Satoshi client), perform your own elliptic curve calculations using secp256k1 elliptic curve to supply values as 32-byte, big-endian, hex-encoded integers and most importantly Armory has seamless integration for signing transactions completely offline. This offline transaction signing can greatly reduce potential attack vectors and there is no other wallet which offers this type of security in as easy to use implementation. This feature should not be underestimated! The Armory client has no networking functionality and requires the Satoshi client to be running at the same time to interact with the blockchain. This can put strain on an older computer and even with the latest hardware there is significant startup time because it uses the Satoshi Bitcoin client for transaction data and therefore needs to download the entire blockchain. But this is the only major downside we could find in this particular bitcoin wallet review of the Armory client. And if your use case requires storing significant amounts of bitcoins that you do not want compromised then the Armory client is the best choice. Originally developed by Bitcoin founder Satoshi Nakamoto in 2008-2009, and continuously worked on by the core Bitcoin development team since then, this is the first Bitcoin client ever created. The client is a fully fledged node of the Bitcoin network, meaning that it can connect to other nodes and help verify and relay transactions, although it cannot mine. Because it is a full node, the client must download the entire (currently 6 gigabyte) blockchain to operate, which can take up to a few days the first time you start the client and several minutes to an hour every time you start the client afterward if you do not keep it running constantly. Your private keys, the mathematical data that makes it possible for you to spend the bitcoins that have been sent to one of your Bitcoin addresses, are stored in a “wallet.dat” file on your computer (which users are encouraged to back up), and the client offers the option of keeping your wallet.dat encrypted. This client is arguably the most trustworthy, since its development is certainly the most heavily scrutinized and is overseen by very well-known and established members of the Bitcoin community. So the probability of it having security holes is pretty low and one reason for it being so popular in the bitcoin wallet reviews. Its features include the basic sending and receiving functionality, as well as a feature that allows you to digitally sign a message with one of your addresses, allowing anyone who knows that the address belongs to you to verify that the message was not modified or forged (the verification functionality is also present in the client). 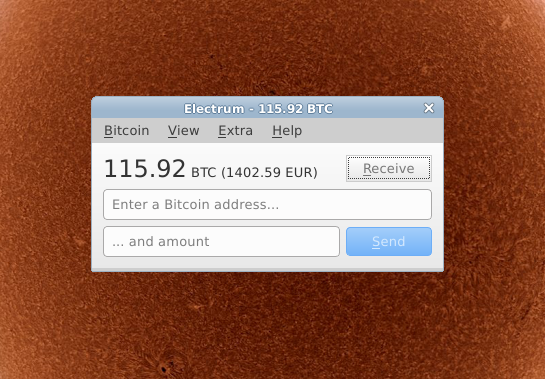 Electrum is a solid lightweight desktop client, meaning that it does not download the full blockchain. Instead, it relies on servers to do much of the work. 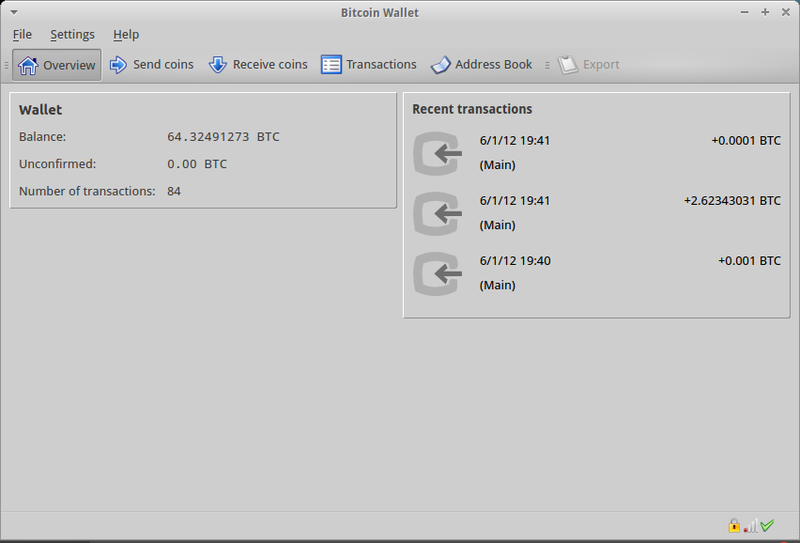 It performs well in the bitcoin wallet review because it empowers you to send and receive transactions, but also has some advanced features: it can generate wallets deterministically from a seed, create and sign transactions offline, sign and verify messages (compatibly with the Satoshi client’s implementation), export a “root public key” that allows applications like AcceptBit to monitor, but not spend from, the wallet, and it can import and export private keys. Unfortunately, these advanced features are only accessible through the command line. Those who only wish to send and receive bitcoins, however, need not worry about the advanced features. 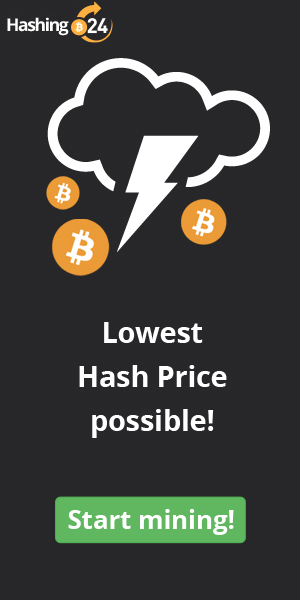 If one wishes just to send and receive bitcoins, Electrum offers the most simple, easy-to-use and minimalistic interface of all the online and desktop wallets. Like Electrum, Multibit is a lightweight client, although it is perhaps one step below Electrum in the regard. 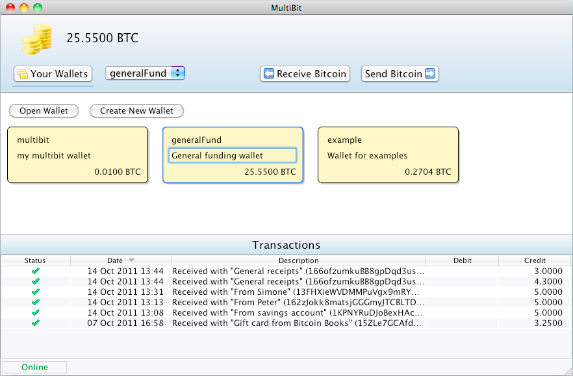 Unlike Electrum, Multibit does not need to rely on servers; instead, it connects directly to the network, using a new feature known as bloom filters implemented in BitcoinQt 0.8 to only download a small subset of the Bitcoin blockchain, and thus avoid the 6 GB download that the Satoshi client and Armory require, while still keeping track of all transactions that are relevant to the user. MultiBit is also known for having translations into dozens of languages worldwide, as well as having the ability to manage multiple wallets. Mobile Bitcoin wallets are specifically targeted for mobile phones and offer a different array of features to consider in the bitcoin wallet reviews. Advanced private key importing and message signing functionality is out, but features such as the ability to create payment requests in the form of QR codes, and scan such requests made by others, are included in all the options, making sending and receiving bitcoins on a smartphone much easier. Note that this page describes wallets for Android only, as Apple does not allow Bitcoin applications on its platform to offer sending and receiving features. Blockchain’s mobile wallet is similar to its desktop wallet in operation, but it only offers the simplified interface of receiving and sending bitcoins, as well as the standard mobile QR code functionality including importing of private keys. The mobile wallet and the desktop wallet can be made to point to the same account. This empowers you you to spend your bitcoins anywhere. Just like in the browser wallet, transaction signing is done client-side, so Blockchain themselves never gain access to your wallet. Like the other major mobile wallets, it does offer the ability to set a PIN for security, but the feature is hard to find – it requires adding a second password from within Blockchain’s desktop browser interface, which will then be required on both your smartphone and your desktop. Bitcoin Spinner differs from many of its alternatives in that it does everything client-side; transactions are signed and received locally on your phone, and your private keys are never sent over the internet, even in an encrypted form. Spinner does rely on a server to function, but its role is limited to simply relaying transaction data and it has no way to gain access to your wallet. However, with greater power comes responsibility. If you forget to back up your private key and your phone breaks or is lost, your funds are gone forever. Fortunately, Spinner does make the backup process fairly easy; all you need to do is go to Settings-> Backup Wallet in the menu and you will be able to QR scan the key or copy it to your clipboard. 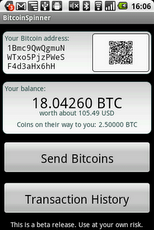 The original Bitcoin wallet for smartphones and written using Mike Hearn’s BitcoinJ Java library. It is by far the most independent of all mobile wallets, requiring no third parties whatsoever to continiue functioning; the client connects to the Bitcoin network directly and stores a small portion of the blockchain locally to verify incoming transactions. Like Bitcoin Spinner, however, it does require the user to take care to manage their own backups. Until very recently, the wallet was very slow and data-hungry due to its need to process the entire blockchain, but its latest version and the advent of BitcoinQt 0.8 means that it can now download transactions much more quickly which is positive for the bitcoin wallet review.